Children who live near busy roads are at a higher risk of having developmental delays, a new study finds. Researchers say that kids who live less than one-third of a mile away from high-traffic roads such as interstates and highways were twice as likely to score lower on tests of communication skills in infancy and early childhood. Living near roads means they’re exposed to air pollution and and tiny harmful particles from exhaust systems and nearby power plants. They also found that exposure in the womb to the tiny particles was associated with a small but higher likelihood of delays in motor skills like hand-eye coordination, crawling and walking. The team, from the Eunice Kennedy Shriver National Institute of Child Health and Human Development (NICHD), says that although cause cannot be established, the findings show how ‘prudent’ it is to limit exposure to air pollution in pregnancy, infancy, and early childhood. According to a 2013 study from the University of New Mexico, around 60 million Americans – one-fifth of the US population – live near a road with higher air pollution. As many as 13.8 million of them are age 18 and under. Previous studies have also linked exposure to pollutants during pregnancy to a higher risk of preterm birth and stillbirth, but few have looked at the potential risk on cognitive development. For the new study, published in the journal Environmental Research, the team analyzed data from the Upstate KIDS Study. The study, run by the National Institutes of Health, looks at the motor and social development of children born from 2008 to 2010 in New York State. Researchers matched the home address, mother’s work address and child’s daycare address of more than 5,000 participants to the nearest major road and measured air pollution levels at each location. From eight months to three years old, the children were tested two to three times a year on fine motor skills, large motor skills, communication, personal social functioning and problem-solving ability. Kids who lived up to one-third of a mile away from a major road were two times more likely than those who lived more than half a mile away to fail the communication test. 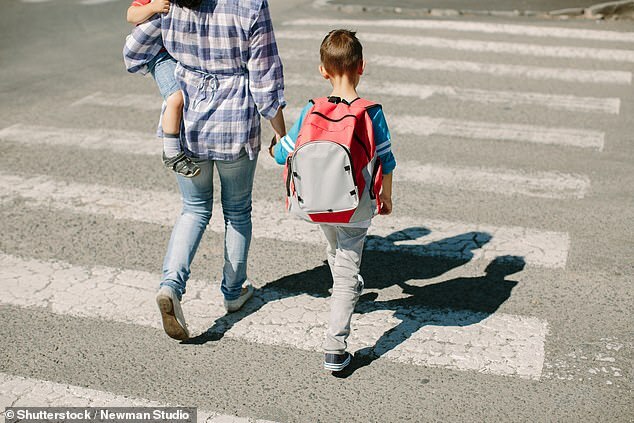 ‘Tests depended on age but they could fail by not understanding direction or not producing speech back to the parents,’ senior author Dr Pauline Mendola, an investigator in the division of intramural population health research at NICHD, told DailyMail.com. The team also looked at exposure to PM2.5, tiny particles that come from various sources including power plants, exhaust systems, airplanes, forest fires and dust storms. PM2.5 particles are tiny – about three percent the diameter of a human hair – so they can stay in the air longer than heavy particles, which increases the risk of inhaling them. Once inhaled, their size makes it far easier for these toxic particles to get into the lungs and, potentially, to enter the circulatory system. Studies have shown that exposure to fine particles can increase the risks of lung disease and heart disease as well as worsen chronic conditions including asthma and bronchitis. Currently, the World Health Organization estimates that seven million people die every year worldwide from exposure to such pollution with most deaths occurring in low- and middle-income countries, chiefly in Africa and Asia. Children who were prenatally exposed to high levels of PM2.5 had a nearly three percent higher risk of failing tests in any of the five skills. Past studies have found that PM2.5 causes oxidative stress, an imbalance in the body between free radicals and the ability to counteract or their harmful effects with antioxidants, which leads to developmental delays. Dr Mendola says the findings are evidence that it might be ‘prudent’ for both mothers and children to limit exposure to air pollution. The team says that the results suggest exposure during early childhood may pose higher risks than exposure in the womb, but that further studies are needed. Dr Mendola says that she’d also like to study the effects that air pollutants have on children’s cardiometabolic health. ‘We are learning more and more about how the environment influences development and it merits attention of wondering: “Can we do things to make it better?”‘ she said.